traditional joyous ceremony with warmth and care. Welcome. My name is Rabbi Yerachmiel Seplowitz. I have been performing Brisses throughout the New York-New Jersey-Connecticut area and beyond for over twenty-five years, with many happy references. Additional references are available upon request. I use sterile gloves and autoclaved instruments. I do not do Metzitza b'Peh. 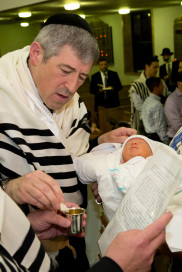 I am an orthodox rabbi who is comfortable working with Jews of all backgrounds. If you have any questions, including additional references from rabbis, medical professionals, and satisfied parents, please feel free to call or email. You can read more information about me on my bio page. Please feel free to call me for more information. If the baby has already been born, call at any hour of the day or night. If I can't take your call, it will go into voicemail. Sabbath calls (beginning at sundown on Friday) should be delayed until an hour after sundown on Saturday.